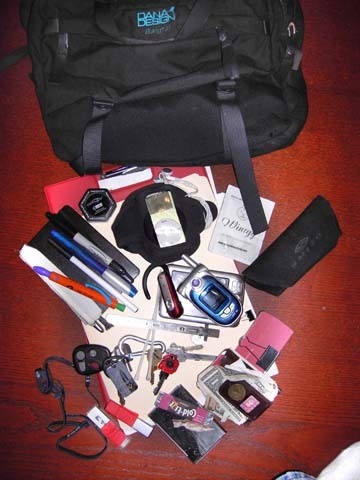 What’s in your gear bag? How do you roll portable? Either way, you’ve got one. You use your bag on the go. Most of all, you’ve got a bag filled with stuff you think is useful enough that if it all went down, you’d be the one swinging from the trees, able to make fire, and live high off the hog while the rest of us can barely remember how to talk. To add a layer of transparency to this, I’ve started with my own daily dragger. Here is the list of what I keep in there and why. I can’t wait to hear what everyone else is lugging around, it’s always been a mystery to me. First off, I’ve got a bag I’ve had for years here from Dana Gleason the former owner/creator of Dana Design bags from Bozeman Montana. Now he’s got a new company Mystery Ranch. It’s the best bag you’ll ever own, (I’ve got a Dana Backpack still as well, they’re bulletproof man!) Plus Dana himself is one heck of a guy, irrepressible and will always stand out in a crowd, (he’s about 6’5″ with a flaming red beard) you can’t miss him! They just make the best bags, period. Now on to the internal goodies! Of course, gotta roll with the iPod mini. Why do I bow at the altar of Steve? Well, they make a great simple unit. I’ve had it for a few years now, and, well, the mini and iTunes just work great. When a simpler solution hits, I’ll be there (why am I bothering to mention this?) I’ve got an armband from tunebelt, it works great, and is neoprene so I don’t worry about it at all. I always keep a tape measure (that little black hexagonal thing) that has metric and standard units on it. You never know when you’ll need (also there’s a straight edge steel ruler there too) I have to measure stuff a lot. You can see below my standard little folder, and if you look closely there are some time management sheets from my buddy David Seah, he makes the best time management forms on the planet and is a brilliant blogger! You can see my pretty silver business card holder, and then another stack just snapped together with a clip. You always need to have them around, you never know who you’ll run into. My wallet is by tokens and coins in Berkeley (I used to work there, shameless plug, it was free years ago). It works. I keep two USB media fobs with me, they’re so much more wonderful than disks, yeah they’re both 128 Mb, but when do you need to download more than 256Mb anywhere anyway? Yes, I’m mildly hipsteresque and take notes on a Moleskine with a space pen (special note, that one was from my Aunt who worked at Hughes aircraft, so it was at least directly space related to begin with). It’s easy to make a tape holder for your pen on the end of the Moleskine and I highly recommend it. Sure makes life easier! For drawing on the go (I told you I was a designer, (it doesn’t mean I’m good at it!)) gotta have the double ended Sharpie, and I found a great pen called the Bic Duo (it’s the blue one) that’s both a blue roller and a yellow highlighter. I’ve got a great editing trick where I circle the items I need to correct in blue, then, when I’ve corrected whatever it was, I highlight over it and it turns black. Then whenever you need to see what you have left to fix, just look for blue! You can see the glasses case for my Smith Toasters (don’t know if they’re still making them) but they’ve got dark grey, amber, and orange/persimmon lenses. Awesome for all sorts of driving and biking, just pop in the lenses you need. The packet you see if a little energy mix, my buddy Jukka does, it’s the last sample I have. It rocks, he’s a good example for it, a freakishly in shape triathlete! Now it’s time for you to let us know what gets you from place to place! Nothing else really besides school books; I know, it’s pretty boring. Marc: What kind of bluetooth GPS? Flash drives seem the order of the day, I wonder how everyone really uses them. Do you guys just move files from home to work/School? Are they to move stuff between machines you are working on, or are they to bring new files to friends/co-workers? My memory sticks are to fill up space in my bag, I hardly ever use them really. Yeah, the USB stick is just on me “because you never know when you’ll need it!”. I have some tools on there but truthfully these days I can email/ftp most things I need around so it’s not that useful any more. The GPS is a holux GPS 236. Great piece of kit, it gets a signal *inside* the car glovebox, locks on from cold in about 20 seconds and has a 10 hour battery life. I’ve had this bag since the dawn of time, or perhaps maybe around seven years. Which, for a bag, I mean. It used to be this vibrant sky blue kind of shiny material with a light pink inside but it’s a bit dull as you can imagine. It’s a sidebag and it’s enormous. -nasal spray, 12-hour moisturizing.. I’ve been addicted since I was twelve. My nose may fall off. -a hello kitty compact mirror… what can I say? girly. -four games: Nintendogs dalmation, cooking mama, animal crossing and big brain academy. again, the girl thing. -a lighter, although I don’t smoke anymore. -Oh! I’ve just found a rice-krispy treat. Ridiculous! I cleaned my bag while doing this. So thanks, this. Thanks Bookie, er how big is your bag, does it have wheels 🙂 . Ta da. With a few band-aids, I’d be prepared for anything. I better go grab some! Together, at the time of inventory taking, the combined weight for everything listed in these three modular kits was 732g, or 1.6lb.I have since added a cliff bar and gum, and keep on the side a pair of glasses in soft unpadded pouch, a bandana/beanie combo (best 1.5 oz of warm ever – headgear and scarf/balaclava). Also in a folder I keep tin foil, waxpaper, chess board (pieces in ziploc), stickers, and google SMS flyers. I made a cardboard and bubble wrap and napkin-material sheath for laptop (sheath – quick extraction). 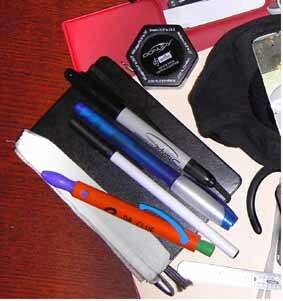 and finally, 1.2mm, 0.5mm point pens, .7mm mech bic pencil, .5 mm zebra metal mech pencil (to take apart if need be – once I used the metal tip as a bearing to fix a minifridge door) clipboard with cardboard taped to back (For boxcutting paper/plastic/whatever) hpda (index cards + binder clip) fine point sharpie…. Yes, I’m obsessed. I’m also really frikkin good at it. Well, I’m a known “Mister Fix-It” to family & friends, and I travel on AMTRAK/GreyHound thru Ca., Nv., and Or. (once thru Az. ), quite a bit……. 2x 5″x3″ 50 page note pads, a small 1in.x1in. stack of post-its, and a couple scraps of sandpaper. 8 1/2×11 5 subject pocketed “BUNGEE” notebook. purple-ink PENTEL R.S.V.P. ballpoint pen (fine). PENTEL Twist-Erase 0.5 mechanical drawing pencil (+a small dispencer of 30 extra leads). LEXAR JumpDrive Secure 256mb flashdrive (contains doc. files of passwords for websites and such). 4GB PNY Attache’ flashdrive (for sharing/storing travel/visit photos). small zippered pouch of various USB & other connector cables & AV/stereo adaptors, including a 15ft stereo headphone extension and “Y” adapter. folding travel stereo-headphones and earbuds. HP digital camera with 32mb and 4mb mem cards (soon to upgrade). homemade 4AA powerpack w/ interchangable tips. Medium-sized pouch containing; PSP w/2x 1GB cards for the 750+ WMA’s of tunes + a variety of optional background images (I make bucket-loads of those as a time-killer) and some extra game saves, + a 32MB for main game saves, 5-8 various games, necessary charger, auto-adapter, and a combo external solar charged power-pack (homemade from yard accent lights, and will charge my other homemade listed above!). Small pouch containing; GameBoy w/several games & charger. 32-CD case w/various PS2 & XBOX games, favorite DVDs, homemade vidclip/picture-discs, and various CD-ROM install CDs for digicam, PSP media convert, etc. 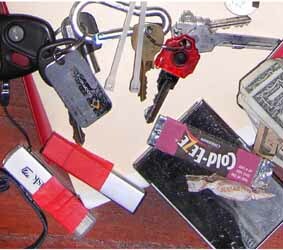 an old ever-dependable well-used Swiss Army Knife (some 15-20 flip-outs, like an American Express card to me!!). small 3 blade pocketknife, and an average sized lockblade. small antique brass jewelers magnifying piece in fitted leather pouch. small handsewn case w/several jewelers & magnetic ended screwdrivers, 2 jewelers files, tweezers, X-Acto, 6in. metal rule, a few paper clips & rubberbands, 8 sized allen-key tool, and a compact cheapo 8ft. tape measure. 2AA MAGLite(3LED conversion) w/bicycle handle-bar mount attached. 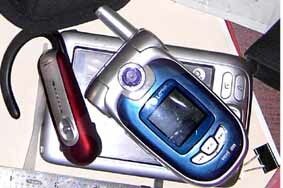 turbo-lighter and stardard disposable lighter. disposable 2LED clicker light (attached with velcro just under a conveniently accessible flap on the bag). travel size bodyspray w/ extra refill. flask of fav “sleep-help” beverage. 6 Tylenol Quik-Tabs, 4 Pepto chewables, a nearly depleted roll of medical tape, about a dozen QTips, & 2 small packets of Neosporin in a baggie. a couple nutri-grain bars and 2 bottles of water. Men’s deluxe personal grooming kit with a couple toothpicks, sewing needles, straight-pins, and a few feet of thread thrown in. Plus 2 bandannas, 3 empty zipper pouches & a 2ft. length of nylon strap w/adjustable buckle for whatever need, and a beanie my momma knitted for me which serves as some padding for everything and has kept my noggin warm on some very cold stops during my travels! Though it seems like a lot of stuff, the contents have proved to be invaluable MANY times over, and really aint a chore to haul around. Mind you, I take this bag camping as well, which this household happens to do at least twice a year. A few years back I quit carrying a soldering iron and portable/rechargable DREMEL mototool (plus accessories) due to not being used much, as well as quite a few of the items John (above post) listed. Obsessed is alright friend, just remember to downsize if peeps start calling ya a tweak! LOL!! Yeah, Life Preserver is a good name for these types of bags! Kid’s cereals are fun to eat, and the free toys in them are PERFECT remedies for the ruccus you may encounter on your travels!! I usually carry a couple, and a HotWheel or 2 “Just In Case!” Kids love them and ya earn kudos with the adults as well, LOL! !